Hola, mis amigos! Today Leroy and I are in the Free and Sovereign State of Yucatán on a clear 25 degree day, our calculations now becoming so good that we arrived this morning on a white sandy beach near Tulum with our toes virtually submerged in the waters of the Caribbean. It may have been a good idea to take our shoes off first, but hindsight is a wonderful thing. Standing on the beach and looking out over the sea, it was tantalising to know that the western tip of my beloved Cuba was somewhere to our left, the Cayman Islands (and all its offshore tax havens) directly ahead, Belize, Guatemala and Honduras to the south and the ruins of one of the last Mayan cities perched on top of the bluff behind us. A walled city, Tulúm/Zama served as a port between the 13th and 15th centuries, and somehow survived 70 years of Spanish occupation before European diseases wiped everyone out. We’re here to explore the Yucatán Peninsula, a region of huge significance for the Mayans and now dotted with other ruins and pyramids, including the world-famous Chichén Itzá – one of the largest and most diverse Mayan centres of its time. The site attracts 1.4 million visitors a year and for that reason Leroy and I are giving it a wide berth this time around. Fortunately we’ve managed to avoid peak-‘Spring Break’, when vast swarms of US college students land on the peninsula, but there are still plenty of other tourists around. From Tulum we made our way to Cuzamá. And when I say ‘made our way’, I mean ‘rapidly appeared in’. There is too much to do today to spend three hours on the drive inland. 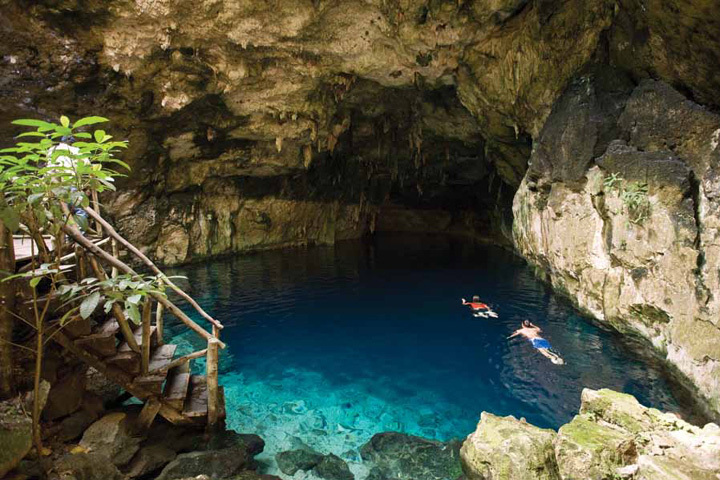 Cuzamá’s main attractions are the three cenotes nearby; amazing natural sinkholes formed when the limestone bedrock above erodes and exposes the groundwater below. The Yucatán is home to an estimated 6000 – although only 2400 are currently registered. The Mayans believed that the cenotes are inhabited by their rain god Chaak. Other stories explain them as gateways to the underworld. After a quick lunch of chicken and rice, poc chuc (a porcine barbeque specialty of the Yucatán) and bottles of brightly hued Mexican soft drinks from the one and only tienda in the village, we’re ready to head to the Chacsinicché and Bolonchoojol cenotes. This time we’ve opted for the local transport – effectively a flat wooden cart pulled along ‘railway’ tracks by a horse. Leroy is planning to dive at Chelentun, which is supposed to be the best for exploration thanks to its clear waters, but I’ll be happy to swim and practice my Spanish on the captive audience waiting patiently above for their passengers to re-emerge from the subterranean depths. Later we’re off to the lively, friendly city of Mérida for a fancy Mexican dinner at Apoala. The kind of dinner that necessitates a shower and change of clothes beforehand. And then maybe a paseo (amble, walk, promenade) down the Paseo de Montejo with the locals. It’s an after-dinner thing. Hasta luego! If you’re reading this and have no idea what’s going on, this post should explain everything.